Arsenal Legend Ian Wright believes Manchester City remains the team to beat in this season’s Premier League title race as Manchester United hunts for their first league title in five years. Manchester City whitewashed Watford 6-0 on Saturday away at the Vicarage Road with Sergio Aguero netting his first hattrick of the season. However, rivals Manchester United strolled to a comfortable 4-0 victory against Ronald Koeman’s Everton and are levelled on points at the summit of the Premier League table. The Citizens sit top of the table only on alphabetical order as both sides shares identical records: four wins, sixteen goals scored and conceding just two. 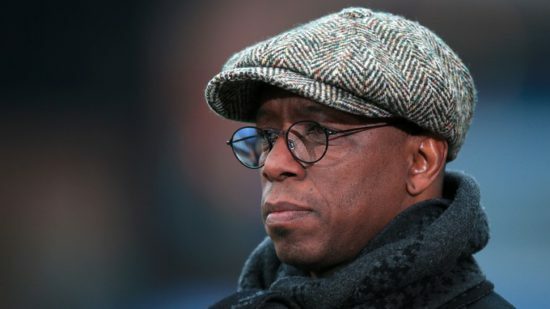 Former English footballer, turned Pundit, Ian Wright believes United can’t afford any slip up as City will pull away otherwise. Ian Wright on Manchester City, he said: “Looking at City and how they won, he knows he needs to win that game to stay in touch,” Wright told BBC Radio 5 live. “You can’t afford to let City ease away and that’s why Mourinho is worried about them, he knows his side have to stay with City. Though it’s still early days into the season, but both Manchester clubs have started the season on fire and the highly anticipated title race between Jose and Pep seems to have dawned on the Premier League at last. The creative force of Henrikh Mkhitaryan and David Silva have been outstanding so far with both players assisting their teammates 9 times this season, on the other hand Romelu Lukaku and Sergio Aguero have been at their prolific best scoring 5 goals apiece in five appearances. Mourinho is renowned for winning the league in his second season, his track record at Porto, Chelsea (twice), Inter Milan, and Real Madrid speaks for itself, but Pep Guardiola is not a stranger to winning league titles and the Special One will expect a fight from his bitter rivals. The Red Devils remain unbeaten alongside Manchester City so far this season and whoever wants to win the league this season must grind out wins consistently.